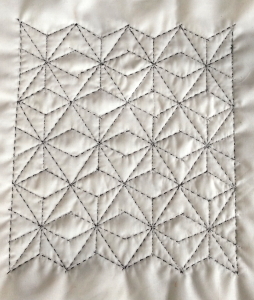 Sashiko Embroidery on my Bernina » What's Under the Needle? 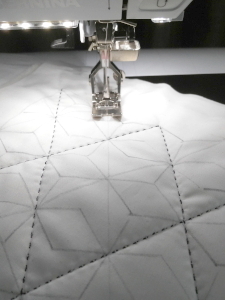 I discovered I could quite easily do it by using a special stitch I have on my machine that simulates hand quilting. To do Sashiko you use a monofilament thread on the top and embroidery thread in the bobbin. Your embroidery thread should be contrasting your fabric. I tested the stitch first on a scrap of fabric layered with a thin batting in the center. I noticed the first few stitches didn't form fully and soon discovered straight lines and curves were very easy, but the monofilament thread broke if I stitched too fast even using a topstitching needle. Oh, and one tip, make sure to start with a full bobbin. You don't get quite as much yardage on a bobbin with embroidery thread as it is thicker. Circles were very slow and you need to get into the rhythm and momentum of the stitching which was 3 stitches forward, 1 backward. It didn't take long to figure out that I needed to pivot on the 2nd or 3rd stitch forward to keep the circle and stitches looking good. Once I'd practiced a little, I thought it was time to find a sashiko pattern to stitch out. There are lots of patterns you can use, I found some free ones to use here: Free Sashiko patterns however I soon realized the one I selected wasn't quite accurate (possibly because it was an image file rather than a PDF) so I drew my own using Inkscape (Inkscape is graphics software you can download for free - actually I have a workshop on how to use this and other free software: Free Software for Quilters). 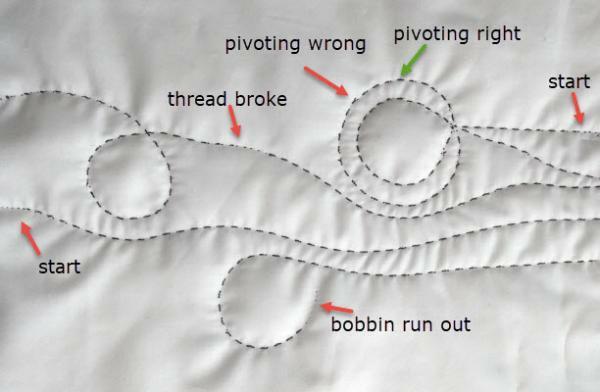 Because I wanted to stitch this out a bit faster, I changed my monofilament thread to a fine overlocking thread that I often use in my bobbin for quilting. I used white as my fabric was white so you could barely see it. It worked, but not nearly as well as the monofilament. 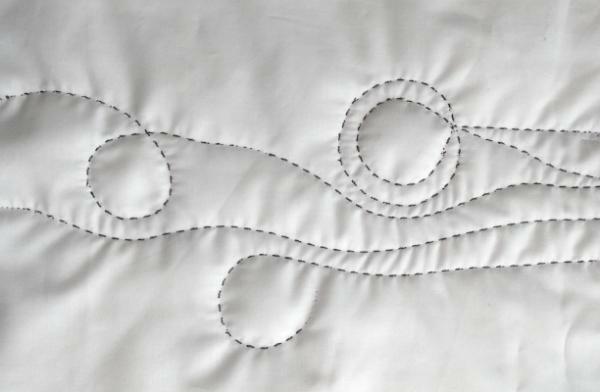 When stitching a design like this, always do the straight full lines first. Try to start on the sides so you don't need to pull the threads to the back for tying off. Whether you do Sashiko or just use the hand quilting look alike stitch, this is a fun way to add some decorative embellishment. In fact, it has given me an idea for a new design that I may just develop in the near future. Give it a try and let me know how you get on. 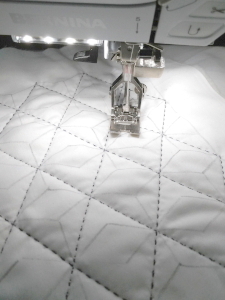 If you don't have a Bernina, look for a similar stitch and adjust the tension until it looks right. Most projects. You can vary the length of stitch and space between stitches.